I thought I’d use this winter scene as the artwork of the week this week seeing as it was very cold when I left the studio this afternoon. It was 3C, blowing a gale and the heavy rain was turning to sleet …..I guess up on the mountains it must have been white and wild! 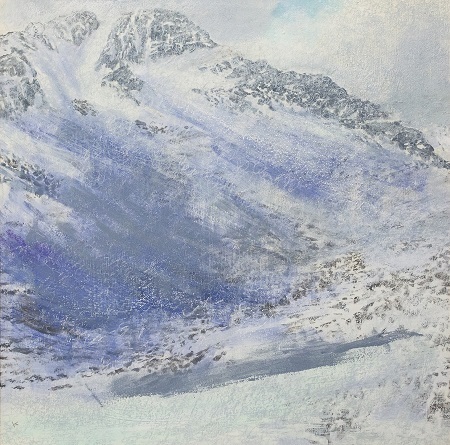 This painting which is currently in my studio, was based on one of our visits to Ben Lui a number of years ago. This original 80 x 80 cm painting costs £1250 but it is also available as a high quality reproduction ….see the ‘Buy prints’ section at the top of this page and follow the link. If the gales calm down over the Christmas week I’m hoping that we might be able to get out for a walk in the hills …and perhaps the snow. Anyway, however you spend your Christmas break, do have a great time.